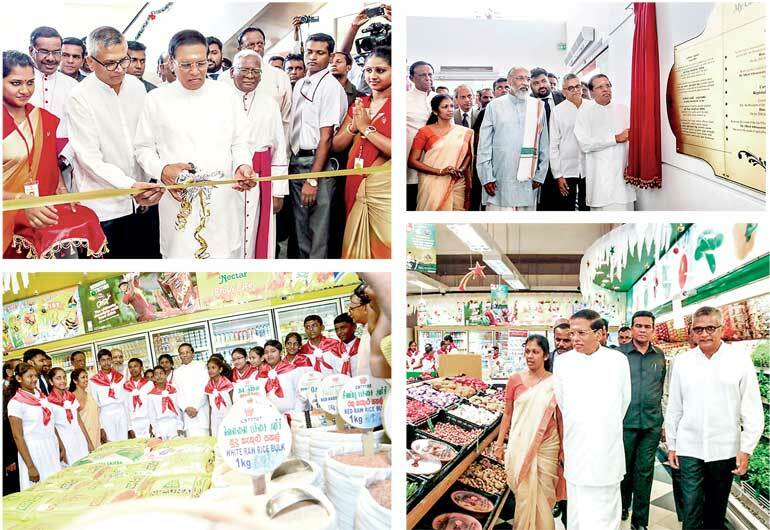 Cargills Square Jaffna, the first luxury family entertainment mall in Northern Sri Lanka and Cargills Bank- Jaffna, Regional Headquarters was ceremonially declared open by President Maithripala Sirisena on Sunday. Cargills (Ceylon) PLC Deputy Chairman Ranjit Page noted that the new complex undoubtedly transforms the Jaffna landscape and is an icon of a new era of peace and prosperity for its people. “With this investment of over Rs. 890 million in the form of Cargills Square, we aspired to provide world class entertainment spaces for our youth and families in Northern Sri Lanka. We are very much aligned with the vision of the President and the Government on the need to bring about sustainable and equitable economic growth and quality of life in the region,” he said. The commercial complex of four floors with a total floor area of 74,000 sqft comprises retail and shopping space, the Cargills Bank, a food court including the only international restaurant KFC, a Cineplex with three cinema screens including the 3-D cinema experience and a basement car park. President Maithripala Sirisena accepts the first deposit after opening the Cargills Bank- Jaffna, Regional Headquarters yesterday. Cargills (Ceylon) PLC Deputy Chairman Ranjit Page looks on. Cargills Bank Jaffna becomes the tenth branch in the Cargills Bank network which has rolled out a fast paced expansion drive across Sri Lanka. Heralding a new era of banking for the people in the area, Cargills Bank launched operations in Vavuniya as the first step towards its expansion into the North. Following the opening of the Jaffna branch the bank will be opening its eleventh branch in Chunnakam. Since 2009 Cargills has invested over Rs. 1.3 billion in the Northern Province including the establishment of Cargills Food City outlets in Manipay, Kannathidi Road Jaffna, Vavuniya, Nelliyadi, Chunnakkam, Mulaitivu and Kilinochchi. Page noted that Cargills has also set up collection centres in Jaffna and Kilinochchi to collect agricultural produce from farmers in the area and have so far brought over 2000 dairy and vegetable farmers into the network across the North. “Our regional investment drive has a direct focus on engaging local communities and improving livelihoods in economically meaningful and socially responsible ways and our investments in the North demonstrate just that,” concluded Page.